This range of UK manufactured precision wound depth filter cartridges are manufactured to give a considerable dirt holding capacity coupled with high flow rates and low pressure loss. These cartridges consist of a perforated support core of plastic or metal onto which yarn is wound at a pre-set rate, providing each rating of element with its own distinctive winding pattern and performance. During the winding process the yarn is usually brushed (or napped). This has the effect of increasing the working area of the elements thus providing a higher dirt holding capacity whilst maintaining the rigid structure. 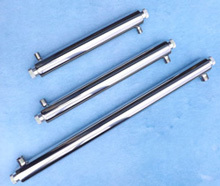 Although the cartridges are mainly for liquid filtration, they can also be employed for gases. Other fibres such as polyester, cotton and glass fibre can operate at higher temperatures and have differing chemical compatibility. 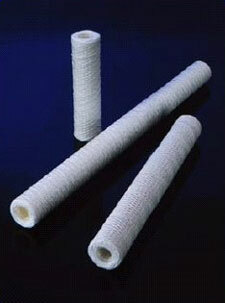 For very high temperatures and for very strong oxidising agents, baked glass fibre elements are used. 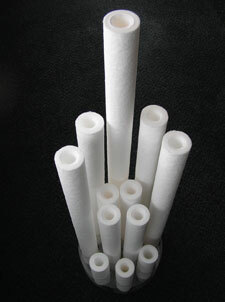 Glass fibre elements are fitted with voiles and stainless steel cores as standard, other cartridges can also be fitted with voiles where necessary in order to reduce fine fibre shedding. New generation spun bonded polypropylene cartridges are the best solution for sediment filtration removing rust particles, sand, silt and other particulate deposits from liquids. High-grade polypropylene fibre is resistant to many chemicals and bacteria growth. Modern technology used to manufacture these cartridges uses fine grade fibres in the inner layers and coarse fibres in the outer layers, this provides accurate true graded density filtration in the range 1 to 100 microns.